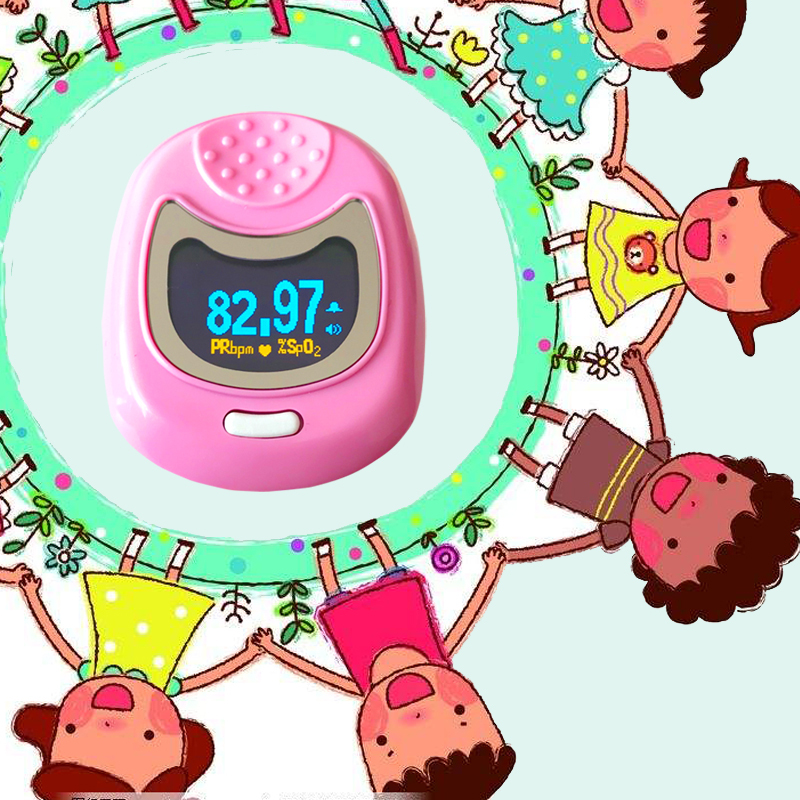 Please notice,no battery in standard.If you want the pulse oximeter with battery, please buy on this link. Features 1. Specifically designed for children 2. Measure SpO2 and Pulse rate accurately. 3. Operation of the product is simple ,low power consumption. 4. Widely used in hospital, home healthcare, oxygen bar, community medical centre, alpine area, sports healthcare etc. 5. SpO2 value display, pulse rate value display, bargraph display, pulse waveform display 6. Low power and finger-out alarm 7. Low power consumption; shut off automatically when no signal. 8. Pulse sound function Technical Parameters 1. Display Mode: 0.96″Dual-color OLED display. Resolution: 128*64 2. SpO2 Measuring Range: 0%~100%, (the resolution is 1%) 3. Accuracy: 70%~100%: ±2% ,Below 70% unspecified 4. PR Measuring Range: 30bpm~250bpm, (the resolution is 1bpm) 5. Accuracy: ±2bpm or ±2% (select larger) 6. Measurement Performance in Weak Filling Condition:SpO2 and pulse rate can be shown correctly when pulse-filling ratio is 0.4%. SpO2 error is ±4%, pulse rate error is ±2 bpm or ±2% (select larger). 7. Interference resistance capacity against ambient light and measurement performance at low perfusion. 8. Power Supply: Rechargable button lithium battery 9. Battery working hour: Theoretical number is 32 hours 10. Safety Type:Interior Battery,BF Type 11. Dimension:46(L) × 40(W) × 29(H) mm 12. Weight:About 35g (with the batteries) 13. Color Options: Blue, Yellow, Pink Certification 1. Registered in the Australian Register of Therapeutic Goods (ARTG) with the code 136606 2. Certified by FDA of United States 3. CE approved by European Union. Content 1. Main unit(without battery) 2. Power cable 3. Power charger 4. Lanyard 5. Carry case 6. Users manualplease understand. thanks.Because of intermational transmit, batteries are forbidden in the pakcages. Therefore, battery is not in packing. The buyer should return the product in the original conditions to us and should bear the shipping cost for return.